We carry orignial manufacturer parts. 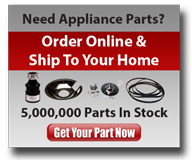 We sell appliance parts for most major brands. Order Online and drop-shipped to your door. Washers – Do not wash blankets in top load washers. Dryers – Be sure to clean lint filter after every load and check dryer vent two times a year. Refrigerators – Clean coils twice a year and be sure door gaskets are in good condition.